Video people, more than most, often accumulate a lot of electronics that are on their way or have become obsolete. It’s hard to get rid of things that might make money when it’s so easy to just leave the gear on a shelf or in a closet. I just discovered an Amazon program that will tell you if they want a particular piece and what they will pay for it. You have to be honest about the condition. There are only three classifications: “Like New”, “Good” or “Acceptable”. They will also provide criteria for the condition in case you are unsure. They’ll often accept old DVDs, Wi-Fi routers, used video games, cable modems. And non-tech items like books on any subject. The Amazon Trade in Program could help you clean out closets and make some extra cash. Some people scour Salvation Army stores and yard sales and become “pickers.” You never deal with the buyer. The Amazon Trade in Program handles all that. After Amazon tells you which items they will accept through a simple web form, they give you a free shipping label. Then you just pack everything and drop the packages at a U.P.S. mailbox. The shipping is free, but you have to pay for the container. Then after Amazon receives and inspects your items, they give you an Amazon gift card. 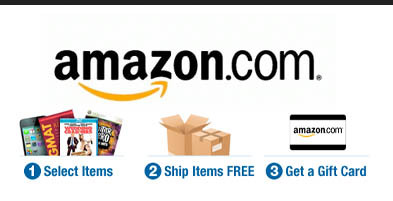 While cash would be nice, I spend so much at Amazon, this will work out just fine. And you get paid before Amazon even sells your item. According to ZDNet and others Amazon’s Trade-In consistently offers the highest cash value for your devices. This is a lot easier than eBay, although eBay certainly has its place. Amazon does take a cut, but it’s not unreasonable.